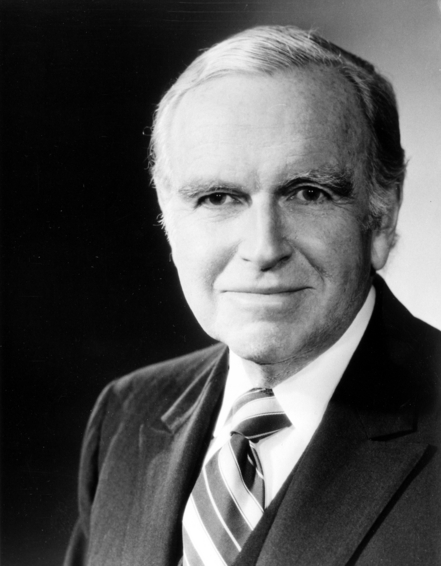 Under Secretary of State from 1961 to 1966, George Ball was active at the State Department in implementing the U.S. trade embargo against Cuba. During the Cuban crisis he opposed the idea of a surprise air strike, like many others offering the analogy to Pearl Harbor, and favored instead the blockade option, which would give time to the Soviets to reflect and consider backing down. Ball later advised against U.S. involvement in the Vietnam War. Photo from National Archives. ARC Identifier 192528. Item from Collection LBJ-WHPO: White House Photo Office Collection, 11/22/1963 - 01/20/1969. Credit Line: Abbie Rowe. White House Photographs. John F. Kennedy Presidential Library and Museum, Boston. Digital Identifier: JFKWHP-AR6295-2S. 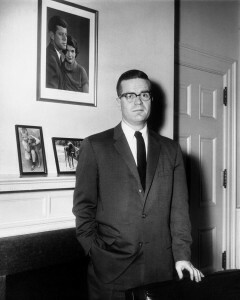 In 1953, at the age of 34, Bundy became the youngest ever dean of Harvard’s Faculty of Arts and Sciences, before serving as National Security Adviser from 1961 to 1966. During the Cuban Missile Crisis Bundy encouraged the President to consider all possible courses of action and sometimes played devil’s advocate or changed his mind. For example, Bundy made the case for doing nothing about the Soviet missiles in Cuba. On October 18 he argued that “we would be better off to merely take note of the existence of these missiles, and to wait until the crunch comes in Berlin”. The next day he changed his mind and favored decisive action – a surprise air strike, as the blockade would not be enough to remove the missiles from Cuba. Credit Line: Robert Knudsen. White House Photographs. John F. Kennedy Presidential Library and Museum, Boston. Digital Identifier: JFKWHP-KN-18579. Secretary of the Treasury Dillon took a hard line during the Cuban Missile Crisis. Initially he favored a military strike but later, along with Thompson, Dillon proposed to begin with the blockade, refuse negotiations, demand removal of the missiles, and threaten further military action. Dillon argued that the President had to show his firm intentions to the Russians and not look as if he were backing down. He first suggested the idea of using the blockade as a way to present the Soviets with an ultimatum to remove the missiles or face military action. Credit: Harry S. Truman Library. Accession number: 72-4202.
Credit: Harry S. Truman Library. Accession number: 78-953. 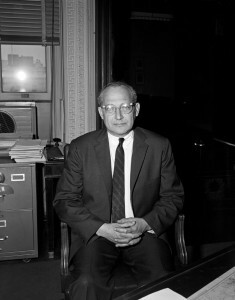 U. Alexis Johnson had served in various diplomatic roles in Asia before becoming Deputy Under Secretary for Political Affairs from 1961 to 1964. During the Cuban Missile Crisis Johnson was present at most ExComm meetings. He thought the blockade could be a valuable first step, combined with other political and military actions, and helped prepare plans to implement it. Vice President Lyndon Johnson, who succeeded to the presidency after President Kennedy’s assassination in 1963, was also consulted during the Cuban Missile Crisis and sat in most key ExComm meetings. On October 16 he sided with those in favor of a strike and advised the president unsuccessfully against conferring with congressmen and U.S. allies on ways to resolve the crisis, as Johnson believed they would provide little help. 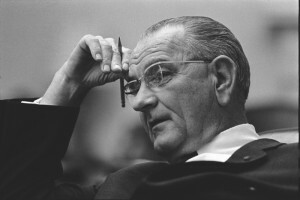 Credit: LBJ Library Photo by Yoichi Okamoto. Serial Number: A4247-29a. Photo by Warren K. Leffler. Library of Congress Prints and Photographs Division. The President’s younger brother and most trusted adviser believed doing nothing about the Soviet missiles in Cuba was “unthinkable”, while a surprise air strike, in light of the memory of Pearl Harbor, was against America’s traditions and would “blacken the name of the United States in the pages of history”. He therefore favored the blockade as an action that would “make known unmistakably the seriousness of U.S. determination to get the missiles out of Cuba” while leaving the Soviets “some room for maneuver to pull back”. 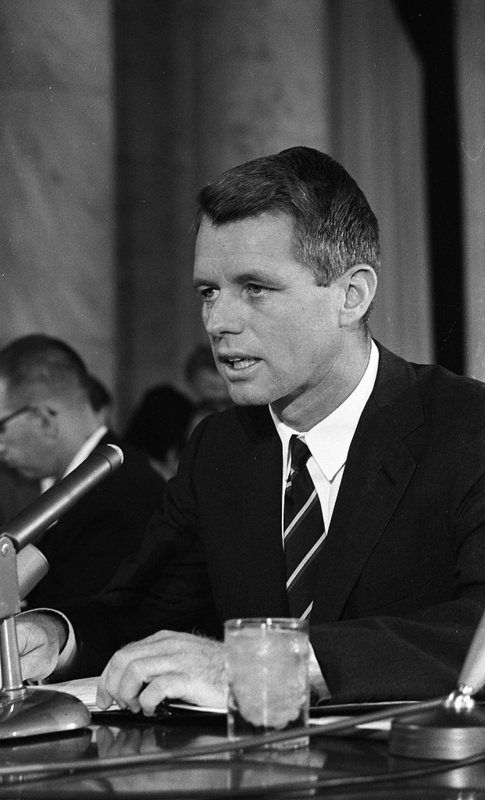 At the height of the crisis, Robert Kennedy met with Soviet ambassador Anatoly Dobrynin and made explicit the threat of an imminent U.S. attack, while also delivering the President’s secret promise to withdraw U.S. Jupiter missiles from Turkey in four to five months. He later wrote an acclaimed account of the crisis, Thirteen Days. 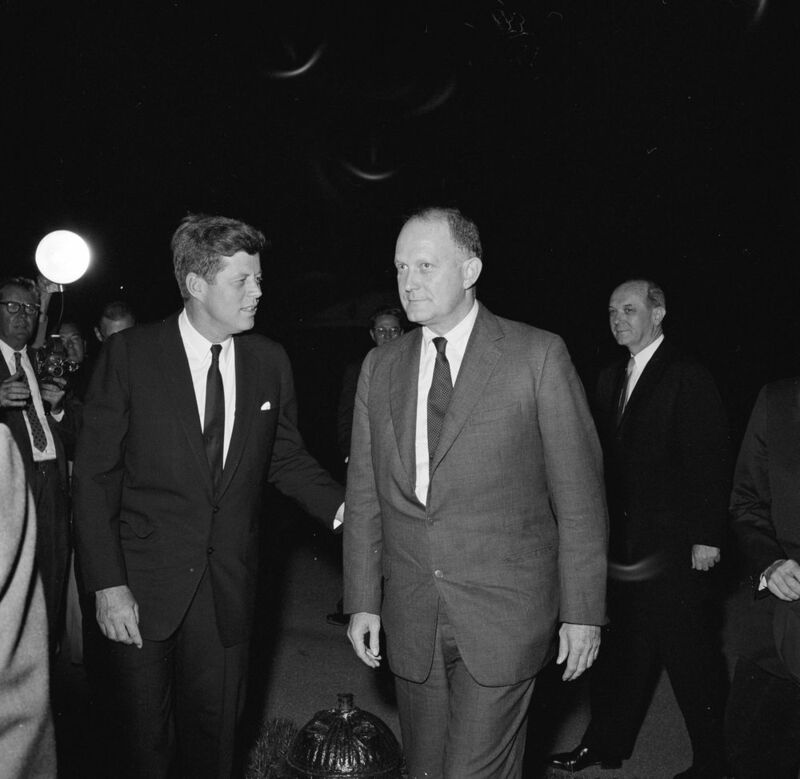 From 1962 to 1964 Edwin Martin served as Assistant Secretary of State for Inter-American Affairs, guiding the Kennedy administration’s policies toward Latin America. During the missile crisis, he favored the blockade option and helped to brief members of the Organization of American States (OAS) to obtain their backing for it. 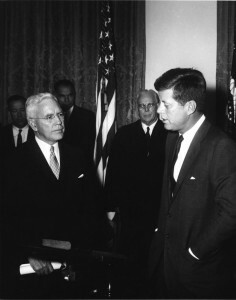 CIA Director John McCone (left) with President Kennedy at swearing in ceremony, 29 Nov. 1961. Credit: Abbie Rowe. White House Photographs. John F. Kennedy Presidential Library and Museum, Boston. Digital Identifier: JFKWHP-AR6917-A. After the Bay of Pigs, John McCone replaced Allen Dulles as CIA Director. McCone foresaw the Soviet deployment of missiles in Cuba and ordered the U-2 flights on October 14 that discovered them. He took a hard line during the crisis. However, he thought a surprise attack on Cuba would force the U.S. to live with a “Pearl Harbor indictment”. Therefore, he argued that before an air strike, Castro and Khrushchev should be given warning and 24 hours to begin dismantling and removing the missiles. 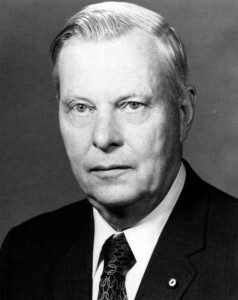 McCone believed a blockade would not be sufficient to resolve the crisis, as it would allow a long drawn-out period during which the Cubans could launch the missiles against the U.S.
A business executive and former president of Ford Motor Co., Robert McNamara served as Secretary of Defense from 1961 to 1968, before becoming president of the World Bank. 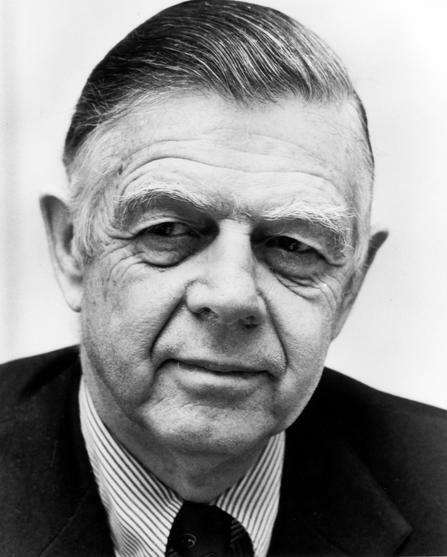 During the Cuban Missile Crisis, McNamara viewed the Soviet deployment as a political issue, not one affecting the overall nuclear balance. He first raised for consideration the option of a blockade on October 16. A persuasive advocate for the blockade, McNamara believed it was important to keep all options on the table and leave the door open to negotiations, rather than issue an ultimatum that the U.S. would order an air attack on Cuba if the missiles were not removed. 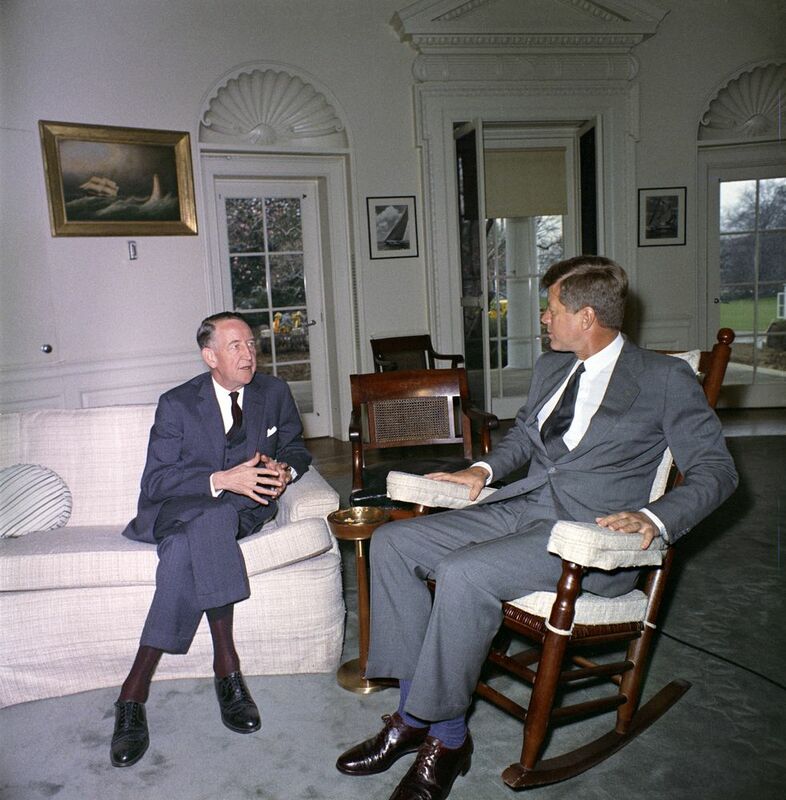 He feared that any sudden military move could provoke a response from the Soviets that could trigger a nuclear war. Photo from National Archives. Item from Collection LBJ-WHPO: White House Photo Office Collection, 11/22/1963 - 01/20/1969. ARC Identifier 192540. Paul Nitze had famously drafted National Security Council memo NSC-68 in 1950, which helped shape U.S. policy during the Cold War, by calling for a substantial increase in military spending and “a rapid build-up of the political, economic, and military strength in the free world” to contain the Soviet threat. As Assistant Secretary of Defense during the Cuban Missile Crisis, Nitze was among the hawkish members of ExComm, urging an immediate military strike, as he believed the Soviet missiles in Cuba dramatically altered the strategic nuclear balance. Photo from National Archives. 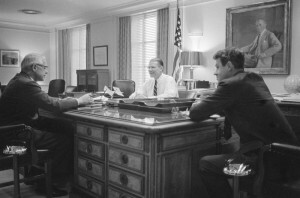 Paul H. Nitze (left) with Cyrus R. Vance and Robert McNamara in his Pentagon office, 04/02/1965 Item from Record Group 330: Records of the Office of the Secretary of Defense, 1921 – 2008. ARC Identifier 6385770. Robert Knudsen. White House Photographs. John F. Kennedy Presidential Library and Museum, Boston. Digital Identifier: JFKWHP-KN-17663. Having taught at Cambridge University and MIT, Walt Rostow became speechwriter for President Eisenhower in 1958, before joining Kennedy’s presidential campaign. In 1961 he became McGeorge Bundy’s deputy, and later in the year he was appointed Chairman of the Policy Planning Council at the State Department. During the missile crisis, Rostow recommended putting on more pressure by instituting a POL (petroleum, oil and lubricants) blockade, but the idea was rejected as others doubted its effectiveness. 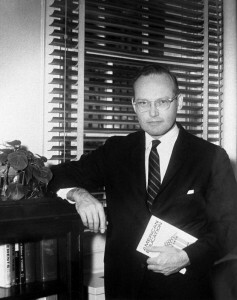 In 1966 Rostow succeeded Bundy as national security adviser and became a strong supporter of U.S. involvement in Vietnam. Photo from National Archives. Item from Collection LBJ-WHPO: White House Photo Office Collection, 11/22/1963 - 01/20/1969. ARC Identifier 192546. Abbie Rowe. White House Photographs. John F. Kennedy Presidential Library and Museum, Boston. Digital Identifier: JFKWHP-AR6295-1G. Army Chief of Staff under President Eisenhower and Chairman of the Joint Chiefs of Staff during the Kennedy Administration, General Maxwell Taylor joined with other hardliners in advocating a surprise military air strike. However, he had his doubts about getting “our feet in that deep mud of Cuba” and believed a costly invasion should be a last resort. Photo from National Archives. Item from Collection LBJ-WHPO: White House Photo Office Collection, 11/22/1963 - 01/20/1969. ARC Identifier 192553. Robert Knudsen. White House Photographs. John F. Kennedy Presidential Library and Museum, Boston. Digital Identifier: JFKWHP-KN-C20888.